Stitchex allows you to specify the currency that you want displayed for your dashboard, cost of goods sold and various reports. These are different than currencies defined per Channel. However, they are accessible on the same settings page. 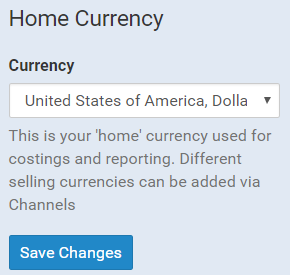 From the Settings > Channel & Currencies page you can set the default "home" currency at the bottom of the main screen. To edit currencies specific to the Channels, you would define those when you setup the Channel. See Next Steps for more details on Channels.